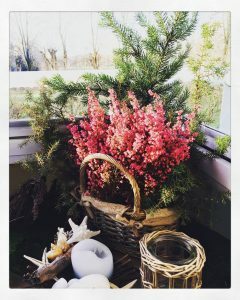 Top Posts in 2017! Thanks to all bloggers and readers! As we close out another year of our blog we want to celebrate all the innovative educators who committed to sharing their reflective practice with us and our community! We are making a difference, telling positive stories about our work in schools and helping others to find new ways to innovate and think differently about teaching and learning in their schools. This year our 52GID blog had almost 4,000 new visitors with over 13,000 page views! In this second year, we had over 30 participants with 100 posts from all over the US, Canada, Australia, Finland, Pakistan, and Croatia! There have been all kinds of cross curricular examples in all areas math, english language arts, arts, psychology, history, science, leadership and more. You’ve had a great year of growth and as each person shares, we all grow in our understanding of the process, its multitude of variations, and how it looks with different learners. If you’ve missed some posts, relax over your holiday break and take some time to search some topics interesting to you. There’s a lot to read about here! Almost 200 readers enjoyed Trisha’s reflection on moving from Librarian to leader through collaborating with teachers working with Guided Inquiry Design. Trisha is a librarian in the district in Norman, Oklahoma where over 400 teachers and all librarians have all participated in the GID Institute and the process is becoming the way students learn across the district. 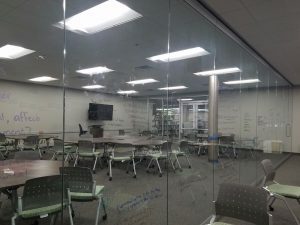 In her post “From Teacher Librarian to Leader” she explores how GID grew across her elementary school building through her leadership and knowledge sharing on the process and through various attempts at different grade levels. With over 450 views, Jamie Rentzel topped the readership this year with her post on using GID in math. Her post Guided Inquiry in a High School Math Classroom, Really? was a huge hit with readers. In this post she connected the need to link students of mathematics to real world applications and GID is just the platform to do that important work. She goes on to explain how she did just that in her unit on Sequences and Series. Thanks to all of you for your thoughtful reflections throughout this year of growth, helping our readers expand into new thinking about GID as a means to dig deeper into design thinking, leadership and new ways of approaching content learning for big gains with our students. Win win win! We hope you’ll join us for this year’s challenge! Who know’s where 2018 will take us! Cheers to all readers and bloggers alike! Well, we have ended up to my last blog writing for now. In the previous blog post I gave a sneak peak to my doctoral research results. There are interesting findings in many perspective. Finlands core curriculum is rather versatile in information literacy issues. The problem will not be in curriculum, when we are working on teaching our students to be information savvy. The challenge we face is in teachers’ skills and use of tools; how to enhance the learning of students information literacy skills. This has been a challenge for a long time. And what are the tools? The studied core curriculum presents issues, which function as preliminary phases before entering the information searching part. There is for example the inquiring mind. This idea is very similar with Guided Inquiry Design. The text in general changed from the 2004 core curriculum to 2014. The earlier often stated, that ‘the student will learn’ and ‘the student is taught’. The new 2014 core curriculum states ‘the student is encouraged’ and ‘the student is supported’, and so forth. This is pointing to a more student centred learning approach. The encouragement and supporting the students to find their own strengths and best learning styles is also about learning to learn. The least interesting issue in 2014 core curriculum results at the moment is the part of information searching and critical thinking. These themes came out strong in the interviews. But what was emphasised in the core curriculum but not in the interviews was working with the found information. In my opinion the tools in GID could be extremely useful also in the context of the Finnish core curriculum. Th e teachers in my study say, that the students have difficulty expressing their doings and thoughts in writing; especially when they would need to reflect on their learning. The tools in GID provides help in the construction of learning and making the progress more concrete and easier to follow for the student. Issues like reviewing, summarising, combining and constructing information is expected in the core curriculum. Students very often forget working with the information, since they are used to making homework like small tasks: finding facts and listing them on a worksheet, presentation or paper. As we know, this is also an issue of how to give and formulate the given assignment. It is also challenging for the students to learn a new way of working. Learning to use the inquiry logs and journal is crucial in making the leanring concrete and in keeping the collected sources organised. These are magnificent tools for teachers to use. The recording of students learning and the tools to support the learning process are the core. When I tested GID in a small-scale project, the teachings during that process were remembered afterwards. The assessment – the new ideology of continuous assessment by the teachers could be greatly benefitted by these tools as well. With the tools the teacher will know how the assignment result was reached during the process – not to mention to get the understanding of moments of possible interventions if needed during the process. This was just a quick glimpse to the issues of how to combine GID and the Finnish core curriculum. The issue is as important as it is interesting. During 2017 I have also been involved in the research of false media, or fake news, whichever expression we want to use. Me and two other researchers have studied the use of sources of the most popular Finnish false media. We have with the same crew also written a book called Valheen jäljillä (On the track of lies) and it will be published in the beginning of 2018 (only in Finnish). Seems like there are powers in the world at the moment, which try to divide people in case after case. Whether it is politics, sports, nutrition, or society. Even social media kind of got out of hands, as former Facebook manager Palihapitiya stated just now in December 2017. Our students have to reach a high enough level of general knowledge, reading skills, critical thinking skills and research skills to be able to come to a decision in whichever issue they face. In my mind, a lot of these issues could be set to a better track by implementing GID ideology. Wishing all of you warm seasons greetings and a very happy new year! Greetings from Finland! The snow finally arrived and made the dark time of the year a little bit lighter. 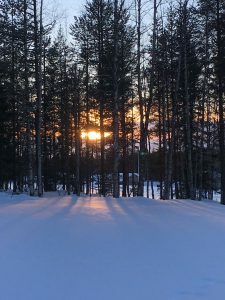 The winter solstice is just days away and then we will be again heading towards longer days. All right, now let us move forward in my blogging week. I wrote about Finland’s situation at the moment in the field of education. Many of these issues have pushed me to work with schools and libraries and to try to make a difference. 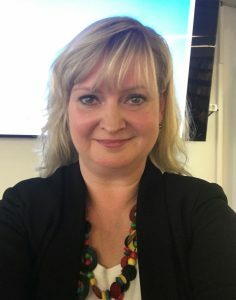 I am interested in information literacy and how it is present in the Finland’s national core curriculum, and how teachers and school librarians understand these terms. The curriculum is not giving any definitions for information managing or information literacy. Five teachers and five school librarians in the same schools were asked how they understand information managing, information literacy and multiliteracy (to clear things out, they more or less have the same substance, but still with clear differences). The results were very interesting. Information literacy is a term of information science but the other two are more from the pedagogical side. I assembled a model of the answers and saw that both professions concentrate in their understanding to information searching and critical thinking. Librarians even more than the teachers. Then, what about the core curriculum? In an open analysis I was able to come up with a model with 13 stages. I then divided the model into three parts, pre-information searching, information searching and post-information searching. With this I want to emphasise, that information seeking needs preparation and the found information needs to be worked with. There has to be some preconditions how teachers in the learning situation should prepare the class. One of the most interesting findings was the phase inquiring mind. The 2014 core curriculum is emphasising student to be curious and study issues from a new perspective and with an open mind. A teacher is expected to encourage students in this. 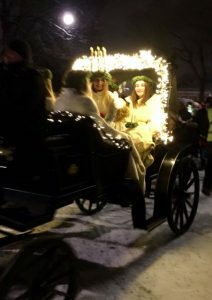 Santa Lucia, the bringer of light, celebrated in Turku. The interesting finding is that most of the times when information literacy issues were mentioned in the curriculum findings belonged to the post-information searching part. This was different from both teachers and school librarians. The core curriculum is however emphasising how the students should be taught to work with the found information. This finding gave me a lot of joy, since my experience and also the research literature shows that this is the difficult part with student. Reviewing, summarising, comparing, compiling, and not just trying to get ready ASAP. The very interesting finding in all this was, that the 2004 had exactly similar emphasis with a little bit different terminology. The results in full can be read in the thesis next year, but personally I am very exited about the results. The problems in students’ information seeking has been proved in the classroom and in research for the last 20 years. It has also been named, that teachers don’t have tools to meet these difficulties in students’ information behaviour. Now Finland has a good curriculum, only thing is to make this work! And in my mind, GID has really a role to play! Finland – 100 years of independence! I am very pleased Leslie saved a spot for me in order to blog about my thoughts. I wrote last year as well. It has been a pleasure to read all your practices in GID, this has given me a lot of inspiration! 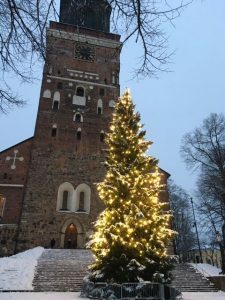 Finland has just celebrated the 100th birthday and it is an appropriate time to take a look at what is going on in education, a short glance. Let me start by presenting myself. I am a librarian gone researcher. I have a history in school libraries. There were issues, which pushed me into information science research. 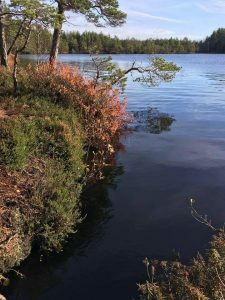 I have planned my blogging week to be divided into three blog posts: one to present the current situation in Finland in the field of education and reading. 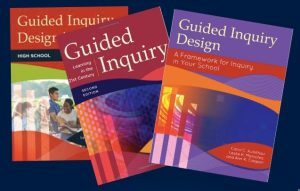 The second to be about my research I am finalising at the moment and the last post to be about where in all this can we see Guided Inquiry Design having a place. Finland is in the middle of a curriculum change, as the primary school changed into the new core curriculum in 2016 and the seventh grade in 2017. The eight and ninth grades will follow in 2018 and 2019. Curriculum change takes place approximately every 10 years. Therefore we are just in the beginning of this period. As changes always, this gave reason to a lot of questions and even problems. The biggest change affecting all the work is the change in evaluation and assessment. Less numbers are given and most of the assessment should be done along the course, as continuous evaluation. The evaluation will be given in written and the teacher should have an evaluation discussion with each student. The students are also required to set their own goals for learning. Another change has come in the form of phenomenon based learning. Every student is entitled into at least one phenomenon project during the school year. This means, that a theme, a phenomenon, is studied in collaboration with several subjects as a theme day, theme week or a longer project worked on once every week. There are several ways to carry this out. However, the problem has been finding the planning time, to fit the projects in to the hourly planning of different subjects. This is much easier to carry out in the primary school (1-6 classes, but to take this to the secondary school context (7-9 classes) with tighter subject boundaries – it does require more coordinating and planning. Then there is an issue of the digital leap. For several years there has been a target to get more educational technology into schools and into learning. The digital leap has been a very hot subject in Finland. It feels like there are two camps: the ones that feel that IT (information technology) is not the key to better learning results and the camp where people feel it is the requirement for good learning results. The issue is more complex than this. A private consulting company had rearranged the latest PISA results. They point out that the digital technology devises, which the student are using on their own in class are even worsening the learning results. The teachers’ use of technology had a more positive effect and also with the IT technology the students are using during past time. These results just indicate that the mere use of technology does not count as pedagogical use of technology. Which already made sense before the study. But the feeling I have at the moment is that the changes have come too fast and the schools were partly left with too little support and further education in this situation. There is a lot of frustration, working over hours and even resistance. Then the issue of reading surfaced this October. The further analysis of 2016 PISA results show, that 10% of students graduating from compulsory comprehensive school (classes 1-9) have such poor reading skills that they difficulty to function in the society and in their further studies. The majority of these 10% are boys. The difference in reading skills between boys and girls is one of the biggest in comparison between all PISA countries. The government took initiative and established the Literacy Forum. This forum (which has 30 members, only 2 from libraries) has a goal by the end of August 2018 to come up with a plan, which would engage the whole nation to a community effort in reading, a reading bee. In my doctoral research I have analysed the Finnish core curriculum looking for issues relating to information literacy skills. I have structured a model of these issues and will present it in my thesis. However, I have lately started to think that how is it that there are a lot of issues in library and information science, which would be of significant help in education, but these models just are not known in schools? Is it that the researchers cannot communicate to the field or in this case, is it about the difficulties to communicate from a field to another? We take for example GID. We who know about the method have to be vigilant and energetic in pursuing contact with teachers and librarians. We should work with shareholders to see the benefits of library and information science resources to education. For some 20 years have teachers presented similar difficulties in students information behaviour. Still we are facing the same difficulties. Communication and collaboration is the key!